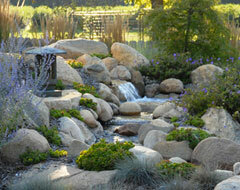 Naylor Landscape is Kalamazoo and Southwest Michigan’s choice for pond and water feature installation. Let us put our experience to work on your home or business’s water retreat. Create a haven for relaxation, reflection, serenity – a garden not just of color but of soothing sounds and flowing motion. Discover the relaxing retreat you can have just outside your door with Aquascape Ponds, Pondless Waterfalls and Fountainscapes expertly installed by Naylor Landscape. You can add even more elegance with Aquascape Lighting to softly highlight your watery escape. View the following videos to explore the possibilities.